“I met a dear woman about 5-6 years ago at Super Target. Over the past however-many years, we’ve become friends. We’ve gotten to know each other’s families, we’ve prayed for each other in hard times, and she envelopes me in the most precious hugs every time I see her in the snack bar to get my Diet Coke. I paid for my groceries, loaded my car, climbed into the front seat and continued to read about Renee and Ms. V. Her friends urged her to set up a GoFundMe account and offered to donate. Certainly a GoFundMe account would be a part of the plan but I could tell that Renee had something else in mind. She was preparing to offer a masterclass in kindness with unforgettable lessons in self-sacrifice, generosity, modesty, purity, friendship and love. And I was about to learn something from her, again. Renee and I don’t see each other regularly and we were not especially close friends when we were in college…she is a couple of years older than me and we each had our own friend groups. Yet her account of Ms. V’s struggle brought back vivid memories of the influence she had on my life. In 1990 I was elected to be the sophomore representative to the standards committee. Renee was the social development chairman so she was also a member of the standards committee. Each week we assembled in the library of the chapter house to visit with members who owed money and members who were struggling to make grades. From time to time we met with someone who needed a warning that her behavior was unbecoming of a member. This was an awakening for me. 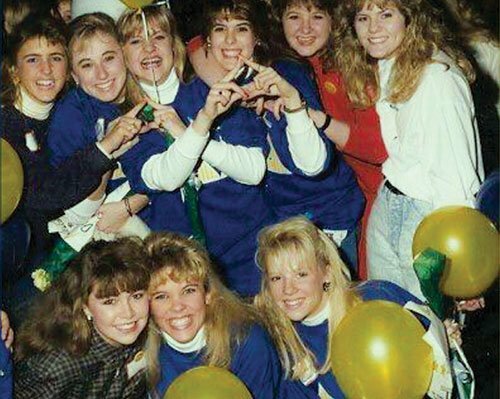 The sisters of Tri Delta were human, with flaws and weaknesses? How could they possibly deserve to be in this chapter? How was I going to achieve my goal of becoming a perfect Tri Delta when so many around me were falling short? Maybe this whole thing was a huge mistake? But each week I watched Renee. She was a calm and compassionate leader. She was grounded in her faith and she showed love and concern to the sisters who needed to visit with us…no matter what their reason. In one memorable meeting we learned that a sister was facing a major challenge to her health and well-being. When I learned about some of the trouble she was in, I thought for certain that she would be kicked out of Tri Delta. But as the committee carefully deliberated about what we should do Renee said, “Let’s take her out for pizza and find out what is going on.” She invited me and another committee member to come along and to my amazement our shared dinner set a plan in motion that would connect our overwhelmed sister to the critical help she needed. Renee did not write her off, she invested her with kindness, compassion and love and it worked! Reading Renee’s stories about Ms. V has been a little like watching an episode of the hit TV show “This is Us” where the past, the present all mix together and connect in unexpected ways. Renee has continued to share updates on Facebook and there have been both ups and downs in Ms. V’s journey. There was an unkind financial counselor who delivered news that Ms. V did not qualify for any assistance, there was a friend of Renee’s who knew about a clinic in Ms. V’s neighborhood and there was a doctor who embraced Ms. V and declared, “Get ready to live!” There was a cancelled surgery, a successful surgery and a promising prognosis.Renee was present for all these moments walking alongside Ms. V, crying with her, praying with her, taking selfies and making jokes to lighten the mood. The story of Ms. V’s and Renee’s journey is remarkable no doubt and Renee’s influence may have very well saved Ms. V’s life. For me it has been a powerful reminder of the lessons that our sisters can teach us even when we don’t know them or see them every day. These are the perpetual bonds of friendship…the bonds that ever increase and grow stronger. P.S. : Since I wrote this, Renee has continued to inspire others even as she faces her own challenges. Stay tuned for more about Renee in a future issue of The Trident…I think Renee will inspire you too.